Well today was yet nother totally neat Sunday as Mr B and I helped out with other local residents tackling the litter which had accumulated in our hedgerows and road sides over the winter months. Sadly no Wombles attended, though it is a long journey from Wimbledon to Oakbank on a Sunday. 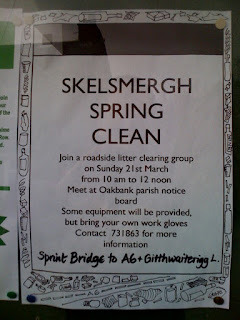 Our local parish councillor organises the pick twice yearly (Autumn and Spring), though this was the first we'd taken part in. Only the other day I'd commented to Mr B on the number of crisp packets and food cartons drivers had thoughtlessly cast from their car windows en route home so it was perfect timing for lending a hand. 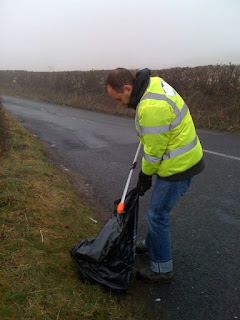 Here's Mr B donning some high vis for the pick as it was a misty morning and some cars take the bends far too fast. I bet people driving past thought we were on community service sporting these beauties! Other Oakbank residents looked on in intrigue with their young. 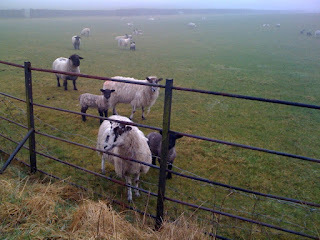 The litter pick really benefits the animals too as litter which blows into the fields could end up eaten by them. It was very tiring work, lots of bending and crouching over a substantial stretch of road. I had to come home early as it was a bit too much for my bump to manage but I did a good hour and a half and Mr B was even longer. He reported that 15 bags of rubbish were collected as well as some old signage and car parts. What a good total for two hours work. Makes you think about how much litter is actually out there doesn't it? It felt really good to be doing something that made an instant impact on our environment. As we drive past tomorrow instead of tutting at the mess others have made we can admire the litter free hedges and know that we played a part in shaping our surroundings for the better.